Bigger than bigger ! 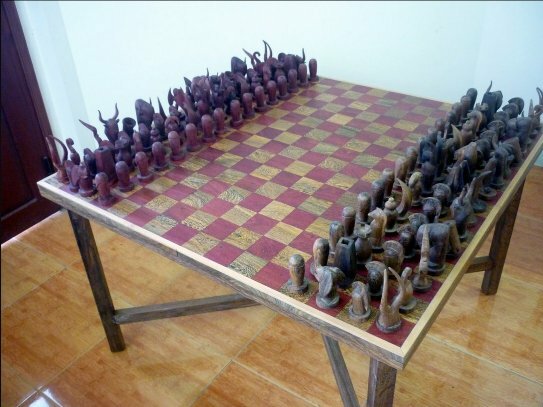 This is a Chess variant with 24 different pieces on a 16 x 16 board, an unrealistic summum. They are 256 cases and 64 pieces per side which gives the same density than for Orthodox Chess. In Terachess one will find again 20 kinds of men encountered in Shako , Tamerlane 2000, Metamachy.and Gigachess. The 4 newcomers are the Star (Cannon+Bow), the Rhinoceros, a sort of Eagle's counterpart, the Bull, a long leaper whose move exists in Korean Chess and the Antelope, an original leaper. The board is a 16 x 16 checkered squares with a white one at the right end of each player. 16 Pawns on 4th row. The white King is placed on the center of the third row on a black square, the black King being on a white square. The Queen lays beside the King. The Eagle is just behind the King, and the Lion is beside the Queen. They are the only major pieces on the second raw, the rest being populated by the Corporals. On the 1st row, the Amazon is in the back line of the King and commands a side with Marshall and Cardinal. On the opposite side, there is the Star on Queen side with Rhinoceros and Buffalo. Knight: exactly as in Gigachess. Pawn: exactly as in Gigachess. Corporal: exactly as in Gigachess. Prince: exactly as in Gigachess. Elephant: exactly as in Gigachess. Machine: exactly as in Gigachess. Lion: exactly as in Gigachess and in Metamachy. Eagle: exactly as in Gigachess and in Metamachy. Ship: exactly as in Gigachess. Camel: exactly as in Gigachess. Cannon: exactly as in Gigachess and in Shako. Bow: exactly as in Gigachess. Buffalo: exactly as in Gigachess. Marshall: exactly as in Gigachess. Cardinal: exactly as in Gigachess. Amazon: exactly as in Gigachess. Bull: jumps to the opposite case of a 3x4 rectangle, like an extended Knight. No matter what intermediate cases contain. Note that it always changes the same color of its square. The same move is found in Janggi, Korean Chess, for the Elephant. Under the name of Zebra, it is also a fairy piece used by problemists for compositions. When a Bull reaches the last row it promotes to a Buffalo. Antelope: jumps 2 or 3 step orthogonally or diagonally. No matter what intermediate squares contain. This is an original piece, exclusive to this game. When an Antelope reaches the last row it promotes to a Star. Rhinoceros: jumps as a Knight then slides diagonally away. This piece is inspired by the Unicorn of mediaeval Grande Acedrex. Star: it moves like a Queen and needs an intermediate piece between itself and its victim to capture it. The Star jumps the intermediate and takes the victim on its square. The intermediate is left unaffected. Like the Queen is Bishop + Rook, the Star is Cannon + Bow. Castling: there is no castling in Terachess. Terachess has been manufactured by Khoa Pham in Vietnam. Few details have changed and the game renamed Fairy Chess, but it is the same. The pieces are wonderful. "Tera" c'est encore plus grand ! Démesurément inouï. L'échiquier présente 16 x 16 cases et il y a 64 pièces par joueur, soit 4 fois plus que pour les échecs réguliers. Il y a 24 types de pièces différents: les 6 classiques, 14 déjà rencontrées sur les autres variantes de votre serviteur et 4 nouvelles. Comme toujours, toutes ces nouvelles pièces sont faciles à se remémorer et ne posent aucun problème au joueur classique qui voudra s'amuser. La densité (nombre de pièce / nombre de cases) est de 1/2 comme pour les échecs orthodoxes.